Probably many of us spend our days sitting down all day long, with hardly ever enough time to focus on taking care of our personal well-being. There are all kinds of reasons as to why there’s not enough time to take care of ourselves. Some people spend long hours at the office, then a long commute home, which can crush the kind of motivation you need to work up a sweat at your local gym. Other people have their evenings occupied raising children and weekend projects. Whatever the case, finding time to break a sweat is good for us. In fact, building up a good sweat at the gym can improve creativity for up to two hours afterwards. Still, how does someone find the motivation to exercise? Whether you’re battling lack of motivation to exercise or lack of time, you need to think about what sitting down at work all day is doing to your life. Research has shown that every day we spend sitting down at work costs us 2.5 hours of our lifespan. When we sit for six hours a day, it means we’ll live 4.8 years less. And goodness, do we spend a decent amount of time sitting down at work. But those who find time to be active get to reap the benefits of productivity. A recent study found that employees who spend 2.5 hours per week being physically active experience increased satisfaction with the quantity and quality of their work. They also take less sick time versus other employees who do not engage in physical activity. 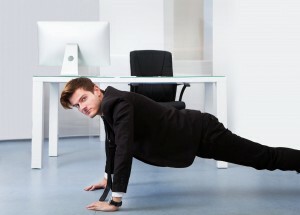 Consider these three adventurous reasons for exercising at work. While the idea may sound awkward and actually uncomfortable to some, working from a treadmill desk is quite possible. Just recently, a company in St. Paul, Minn., conducted a yearlong study with its finance workers and found that the productivity of the 40 treadmill users rose by 0.69 points higher than before the project began. The measurement was on a 1-to-10 scale. According to Avner Ben-Ner, a professor at the University of Minnesota’s Carlson School of Management and an author of the study, he mentioned, “a little bit of walking is useful because it means there’s more blood flow to the brain,” which is good for tasks like solving problems or taking conference calls. Plus, he did say, “You get more oxygen and it increases the ability to think.” Mr. Ben-Ner also mentioned that participants needed to adjust to the treadmill desk initially, which makes sense of the motor skills being exercised. Not only can you make a conscious effort to improve productivity at work, but you can find creative ways to lose calories. While a treadmill desk sounds interesting, most of us, don’t have the opportunity to try one out. So we have to find different ways to burn calories at work. You can bring a fitness ball to work, take the stairs instead of the elevator, and do desk push-ups. Although you may find yourself looking a little silly in front of your colleagues, who cares if it makes you feel good. Why not go for a walk during your lunch break? Lisa Stone, co-founder and CEO of 100 million-reaching content networkBlogHer, tries to make room for an hour walk or run, “…Even though it’s hard to find the time and motivation, I’m so much smarter and more creative when I do it, I won’t even risk not doing it anymore.” Maybe going for a walk won’t factor into getting your creative juices going, but at the very least, you’ve burned some calories and perhaps cleared your thoughts. Some organizations offer employee wellness programs that reward employees for healthy behavior. Stacy’s Pita Chip Company offers its employees an annual $500 benefit towards anything that is health and fitness related. If there’s an opportunity to earn rewards for being healthy while at work or just in general, then why not take it? And here’s one reward all employees seek, based on a study from the Journal of Labor Research, employees who exercise on a regular basis earn 9 percent more than inactive workers. According to the experts, regular exercising helps with improving employees’ attention, reasoning, and memory. Other research has shown that regular exercise can improve a person’s mood and lowers stress levels, and also play a major role in performance, relationships and concentration. That doesn’t sound bad at all, right? Ultimately, whether you lack exercise because of motivation and time, or the incentives to do so, everyone needs to exercise more. Research found that less than 5 percent of adults participate in 30 minutes of physical activity each day and the rest of the results are gloomy. Exercising is not just about feeling better, it’s about living better. So if you can, find a way to make time to exercise, even if it’s for a couple of minutes every day. Every little bit helps.